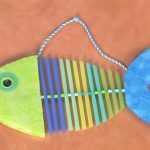 Fishies swimmin in the sea need love too.Let the kids craft a whole school full of these adorable Valentine Fish for the Valentine’s Day bulletin board. To begin cut out paper hearts of varying sizes. Using the picture as a guide assemble the hearts on a background piece of paper, gluing each heart on to create a very special Valentine Fish. Use a fine point marker to draw in bubbles and eye.